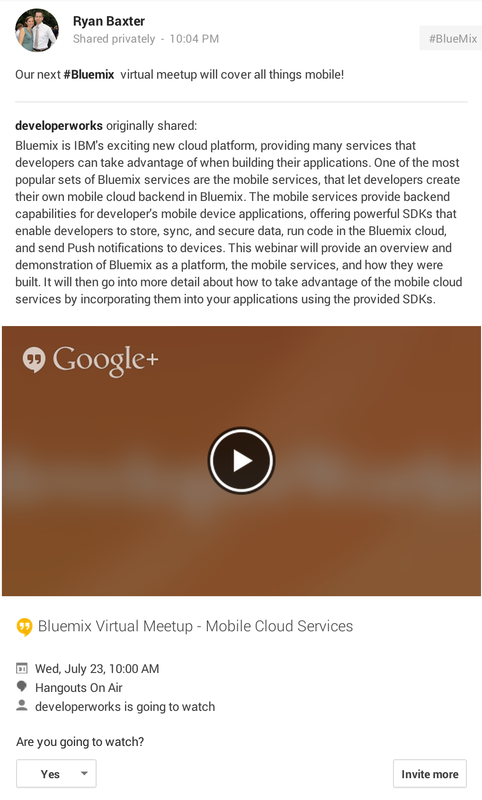 We have scheduled our next Bluemix virtual meetup for July 23rd at 10 AM EST. We will again be using Google Hangouts (hopefully without the audio problems this time). For this meetup we will be focusing on the mobile cloud services in Bluemix, there will be plenty of information and demos to help you get started. At the last virtual meetup we had a lot of questions on mobile so I figured this would be a good topic. You can download this .ics file to add the event to your calendar and be sure to respond whether you will be attending on the Google+ events page.